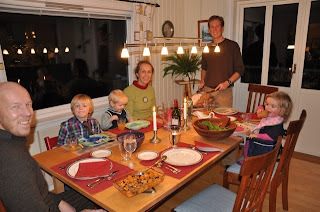 We managed to find a 5.9kg (about 12 lbs) turkey, I still had a can of pumpkin puree in the cupboard that survived the trip over the Atlantic, and we never were a big fan of cranberries, so Norwegian tyttebær was a good substitute for our first Thanksgiving as ex-pats. It was one of the first Thanksgivings that we've hosted in the 8 years we've been married. 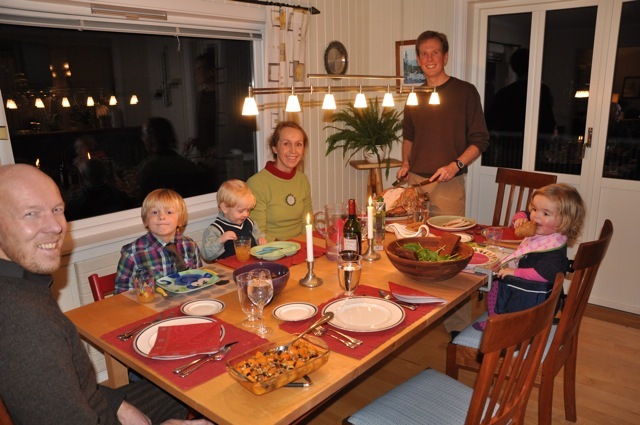 Nearly every Thanksgiving has been spent with the Blumberg family in Thetford, Vermont, whom I affectionately refer to as our "surrogate Jewish parents", as they are parents (and in-laws) to our dear friends who live in Alaska, we feel like we fill a void around the table, and, well, they're Jewish. And we're not, so it's funny and affectionate. Really! 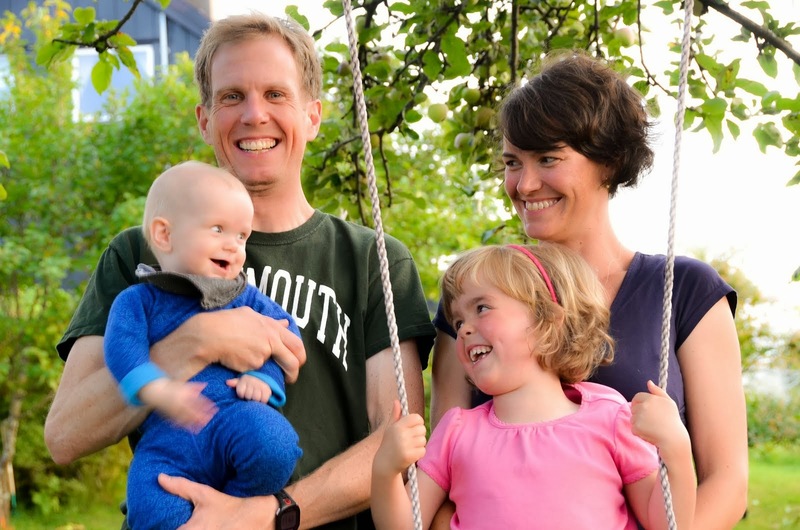 THIS year we invited our new friends, whom I will call R&M, and their boys K&S, who are at Greta's barnehage. S. is in Greta's class, and K. is 5 years old, and in the oldest kids class. R&M have been so welcoming to us, inviting me to M's 40th birthday party, to a workout group of women each week, and similar invitations for Erik as well. R. even jumped my car Wednesday night, when the battery died at the barnehage, and said to me in very clear English, "that's what friends are for." So, we felt they were worthy of the invitation, and they were enthusiastic guests. We tried a number of new recipes, including stuffing the bird with dried fruits and nuts (delicious), and a tasty sweet potato recipe with raisins and walnuts as well. The turkey was basted with an orange flavored liquid, so we had a fruit theme to our meal. I made two apple pies and a pumpkin cheesecake, of which Erik brought one pie and the cheesecake to work today, as it was his day for Friday "treats". The pumpkin-flavored dessert was a new flavor for the Norwegians, and since they ate 3/4 of it, I think it was a hit. And now a quick Top 10 Thankful List, in no particular order. I am thankful. . .
1. That our house in Vermont sold before we left the state. 2. That our cars sold before we left the country. 3. That our dog is alive after flying in the belly of a plane during a hot August in Minnesota. 4. That we have a comfortable, warm, cozy home, if only for a year. 5. That my husband* is talented enough and intelligent enough and persevered long enough that this idea of moving to Norway actually became reality! 6. For technology that allows me to see my friends and family, and talk to them for pennies, if not for free. 7. For my family, who instead of crying "you're moving where?" said "This will be such a great adventure for you. When can we visit?" 8. For Tina Fey, who makes me giggle and proud to be a outspoken, liberal-minded woman in my (gulp) mid 30s with brown hair and the need for corrective lenses. 9. For my rosy-cheeked little daughter, who delights and amazes me every day. 10. That I'll be starting a level-2 language class in January**. So then, even if the class moves slowly, at least I can blame someone else for not challenging me, versus now, when at the end of the day I've learned absolutely nothing, I only have myself to blame. *I'm thankful for Erik for many other reasons, too, but I opted to make it a Top 10 list. **It's true! Just got the news today! Mmmm...Ellen would be proud! But where are the marshmallows? Glad you were able to enjoy Thanksgiving with new friends! Will have to remember our tree chopping brunch and post photos to FB for this year. We'll have a virtual event. What a great list of things to be thankful for (I thought numbers 7 & 8 were especially noteworthy). So how'd the orange-flavored turkey turn out? We usually stuff a lemon or two up the turkey's backside...kind of the same idea.